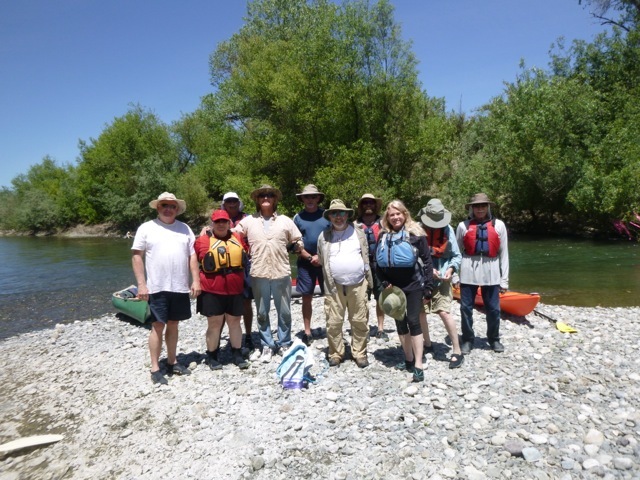 Great paddle yesterday from Veterans Memorial Park in Healdsburg to Steelhead Beach. First time I have ever paddled past Wohler Bridge. Paddling through the section that is normally portaged was a little tricky, but we all got through well. Here is a photo at launch with the Headsburg bridge in the background. The first rapid which goes under the freeway bridge is the most challenging part of this trip. Two things to remember: take the central channel (not the tiny leftmost one), prepare to zag sharply left maybe using the bottom of the boat to pinball off the rocks to make a fast zig to the right. Splashy, so a skirt would have been good. We had 400 cfs in Healdsburg with an additional 100 cfs coming in at Dry Creek. Perfect conditions, a well-matched group, a beer afterwards at Stumptown in Guerneville. It’s not often that the weather is beautiful, there is enough water in the river, and the inflatable dam below Wohler Bridge is down, so we did it again Friday, just five days after the paddle above. I’m sorry I took the advice of a canoeist who told me to approach the first rapid, under the freeway bridge, to the left of the main channel. It put me in poor position for the “zag.” I would have been better to stay right in the main pillow of water and use it to do the zig-zag. 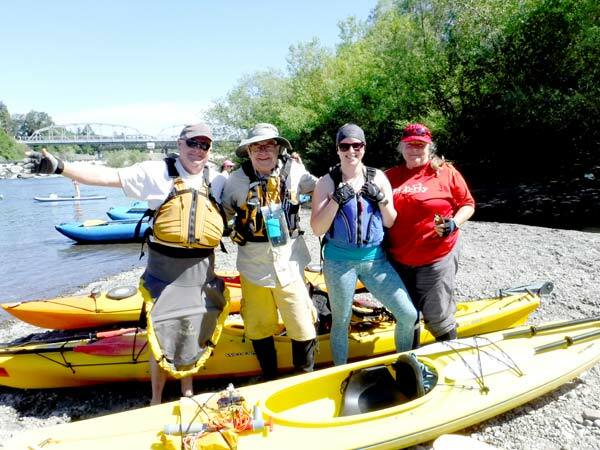 MANY more people on the Friday trip, and a much wider range of capabilities, including a first-time paddler who went over in a cross-current under Wohler Bridge and had to be lined through the tricky drop by the fish trap. Afterwards, we had a fun time at a happy hour in Windsor.